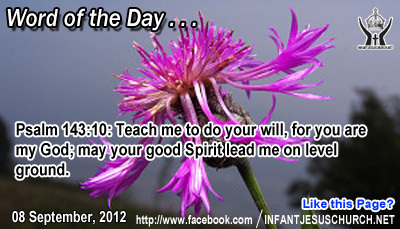 Psalm 143:10: Teach me to do your will, for you are my God; may your good Spirit lead me on level ground. Heavenly Father, we want you to truly be God in our life. We renounce any attempt on our part to try to manipulate or use your grace and kindness for our benefit. We submit our will to yours. But Heavenly Father, we confess that we struggle at times with our own selfish and evil desires that lead us astray. Please forgive us when our heart is cold and our ears are deaf to your will. Please, take control of our life today. Through Infant Jesus, we pray. Amen. Matthew's genealogy is arranged in three sections portraying three immense stages in the religious history of the people of the old covenant. The first stage begins with Abraham, the father of the selected people, and ends with David, God's anointed King. The 2nd stage is the exile of God's people in Babylon. This is the period of Israel's disgrace and disaster due to her unfaithfulness. The 3rd stage takes us to Jesus, God's anointed Messiah. Jesus the Messiah is the through descent of Abraham and David, and the rightful heir to David's kingdom. God in his mercy satisfied his promises to Abraham and to David that he would send a Savior and a King to rule greater than the house of Israel and to deliver them from their enemies. Jesus is the completion of all God's promises. He is the hope not only for the people of the Old Covenant but for all nations as well. He is the Savior of the world. In him we receive acceptance into a royal priesthood and holy nation as sons and daughters of the living God. Do we recognize our spiritual genealogy and do we accept God as our Father and Jesus as the sovereign King and Lord of our life?